Now, I have to say, it's a pet peeve of mine calling things pizza that aren't. Pizza is my favorite food in the world. Zucchini will never be pizza, cauliflower will never be pizza. But this has the saucy, cheesy, pepperoni goodness of pizza, along with a nice healthy platform of zucchini. I briefly considered swapping out the pepperoni for turkey pepperoni, but in the end I didn't. These would also be fantastic with eggplant, and for an extra splurge, you could always egg white wash, breadcrumb and bake the zucchini. Thank you so much to the Taste of Home Test Kitchen for this winner! Check out the links below. Thanks so much to Wendy for hosting, and to all the other #FestiveFoodies for sharing their #FootballFood winners! Preheat broiler. Arrange zucchini in a single layer on a greased baking sheet. Broil 3-4 in. from heat just until crisp-tender, 1-2 minutes per side. 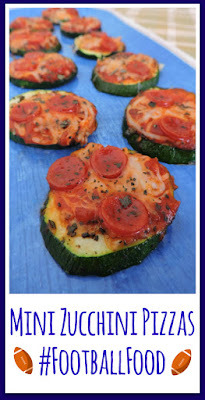 Sprinkle zucchini with salt and pepper; top with sauce, cheese and pepperoni. Broil until cheese is melted, about 1 minute. Sprinkle with basil. Yield: about 2 dozen. Great minds Jolene...while our little veggie pizzas are not the real thing they still are delicious in their own right. That's for sure! I cannot wait to try your butternut squash version! What a great idea! I really should cut back on the calories a smidge and this is a great way to do it without giving up the fun flavors! Oh, I bet I could get the kids to eat these! Where did you find the mini pepperoni? I've done this for years when zucchini got away from us in the garden. Turkey pepperoni is what I have all the time in the house and it does work great on these. They make great snacks...and take away that pizza craving. I haven't quite ventured into turkey pepperoni or bacon yet. I can't wait to try these on fresh from the farm zucchini and eggplant! I kind of feel the same as you, but when you add pepperoni... yum!!! The pepperoni definitely brings it to the next level. I plan on doing some with some cooked crumbled hot Italian Turkey sausage too! I would totally enjoy this treat! Perfect for a Super Bowl Party! Thanks for linkingup with us at Celebrate 365's Football Party Round up!